Picus goertae P. L. S. Müller, 1776, Senegal. At least eight races described, four currently recognized. English: African gray woodpecker; French: Pic gris; German: Graubrustspecht; Spanish: Pico Gris. About 8 in (20 cm); 1.4-1.9 oz (40.5-52.5 g). A small woodpecker with a long, straight, rather broad bill; upperparts are unbarred green or brownish green with a red rump and barred brown tail; underparts are gray with an orange to yellow belly patch and some barring on flanks. Male has a pale, striped, gray head with a red hindcrown and nape; female lacks red on head. Found in a broad swath of forest and savanna habitats in central and West Africa; from sea level to 9,800 ft (3,000 m). 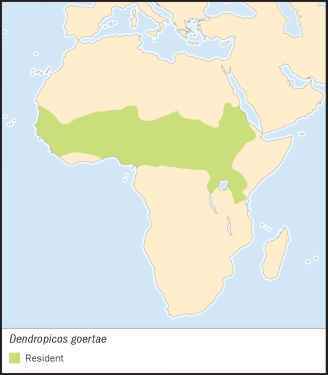 D. g. goerte, West Africa to Sudan, south to northeastern Zaire; D. g. koenigi, the Sahel zone across central eastern Mali, Niger, Chad, to western Sudan; D. g. abessinicus, eastern and northern Sudan and northern and western Ethiopia; D. g. meridionalis, south central Zaire, probably to southern Gabon and northwestern Angola. Wooded and savanna areas, thickets with large trees, riverine forest, gardens, mangroves in some areas. Found in pairs and family groups, moves rapidly through its habitat. Often at forest edge. Forages on the ground and in live and dead trees, especially trunk and larger limbs. Occasionally takes insects in flight. Diet includes ants, termites, beetle larvae, and other arthropods. 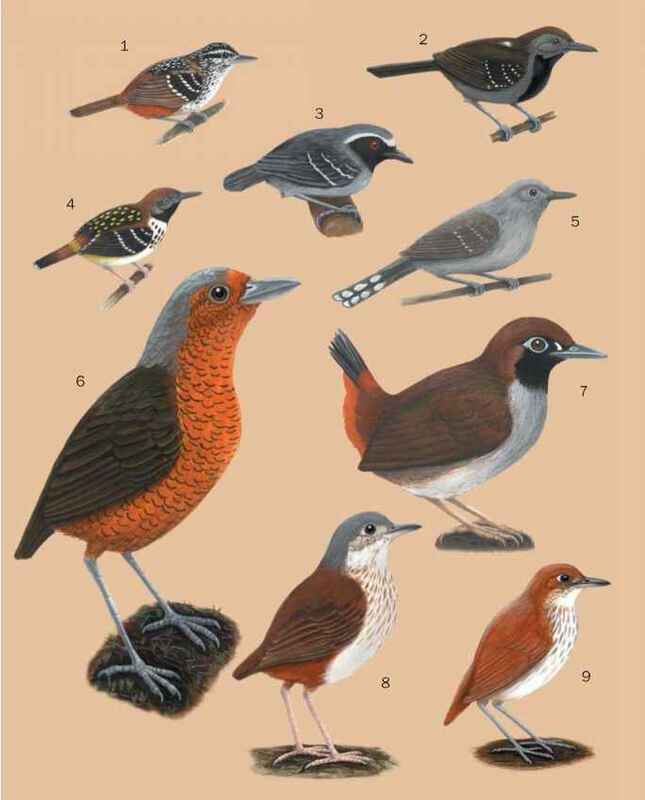 September to November in eastern Africa; sexes share nest cavity excavation at 1-60 ft (0.3-18.3 m) above ground in a dead tree or dead stub of a live tree. Clutch size 2-4 eggs. No data on incubation, parental care, or fledging.